I have a problem. And, as with so much in life, it’s a problem which brings Jane Austen to mind. Fellow devotees of Miss Austen will know that Emma Woodhouse, heroine of the eponymous novel, just can’t bring herself to like Jane Fairfax. Jane is the niece of one of Emma’s neighbours and, despite the two girls being roughly the same age and Jane being intelligent, educated and otherwise the epitome of the suitable companion, Emma finds her – well, more than a bit annoying. The problem, we are told, is that she is too “reserved”. Emma can’t work out what she thinks about anything; she can’t confide in her; she can’t instruct her, or scold her, or laugh with her. In short, she can’t work out what makes her tick. As a result, she decides the less she has to do with her, the better. Mid-way through plotting my second novel, I’ve had to conclude that my main character has more than a touch of the Janes. Whilst several of my minor dramatis personae have introduced themselves with unexpected enthusiasm, telling me all sorts of unimagined things about themselves, Lucy – or maybe Chloe (this woman is such an enigma, I can’t even work out what her name is) – is keeping resolutely shtum. Of course, I know what happens to her – at least, the big stuff that forms the core of the plot. My problem is that I can’t work out what she thinks about it. And that means I don’t know how she reacts. Which is a bit of a problem when it comes to trying to tell a story. It also means I’m finding myself coming over all Emma Woodhouse – I mean, I know Lucy’s a very private person and all, but surely she can tell me what she’s thinking? I created her after all! Doesn’t that entitle me to some kind of confidence? Doesn’t she have any sense of gratitude?! Quite apart from needing to understand her better to work out what she’d do in the different situations in which she’s going to be finding herself, I can’t help but feel I need to get to know Lucy if I’m going to be spending time with her. I mean, writing a novel takes a long time. Who wants to hang around with someone who never tells you anything about themselves? And I want the reader to sympathise with her – let’s face it, if she refuses to give much of a clue as to how she feels about anything, that’s going to be an uphill struggle. In Emma, Emma and Jane do eventually become friends: Jane has a secret, you see, and when that secret is revealed Emma feels that she understands and can forgive her previous reticence; Jane, in turn, is freed from the restraint that left her unable to engage with Emma frankly and openly. So what lessons are there here for Lucy and me? Clearly this woman has a secret she isn’t telling. I need to get her to open up. I need to get her to trust me. The question is: how to do it? I’ve already told her I know about her past. It didn’t help. She just looked at me, as if saying, “You might think you know…” So perhaps I’ll have to start small. Maybe I can get her to tell me what her favourite film is, or whether she prefers tea or coffee, baths or showers, Fitzwilliam Darcy or Christian Grey. Perhaps that will do the trick. But I can’t help thinking: isn’t it a shame you can’t just take your imaginary character to the pub? This entry was posted in Uncategorized and tagged characterisation, characters, Jane Austen, writing on 04/12/2013 by yakinamac. Right, that’s enough of that. 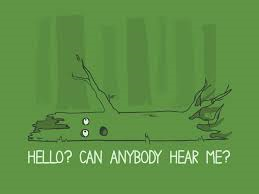 Despite being one of those people who if asked “If a tree falls in a forest and there’s no-one there to hear it, does it make a sound?” would reply, “Yes, of course it bloody does! What a ridiculous question!” I have found my mind wandering in a vaguely philosophical direction in recent weeks. To start with, I breathed a big sigh of relief that I’d never tried my hand at any kind of script. I wasn’t sure I’d like that, I thought to myself, handing over my work to someone else – a whole bunch of someone elses, in fact – and then holding my breath to see what emerged at the other end. I liked the feeling that, in writing a book, I was in control: my characters would say and do only what I told them to. Ok, sometimes they developed minds of their own and tried nudging me in different directions to the ones I’d planned, but when it came down to it, I was the person who decided what words went on the paper; the product began and ended with me. Until I thought about it a bit more and realised that was rubbish. So the most recent incarnation of my book is already, to a considerable extent, the product of a whole range of people: my brilliant beta readers, who took so much time to give me their comments and encouragement; a whole pile of editors, who distilled their reasons for rejecting me (hmph!) with varying degrees of clarity; and my agent, who helped me work through it all and come up with some ideas to respond. But of course, it’s not just those people who are helping decide what my book will be – ultimately, it’ll be the creature of whatever handful of people I can bribe, cajole or threaten into actually reading it. I might think I’m the god of my own little literary world, setting out my story, deciding who does what to whom and why; but just because I think I’ve explained something, it doesn’t mean my readers will agree (there’s a life lesson lurking here somewhere…). They might interpret the words I think of as being only mine in any number of different ways. They might see all kinds of different motivations for the way my characters behave. They might – whisper it – not like the characters I like. At the time, I found this rather annoying: couldn’t she just put all those irritating people who obviously thought a woman should sacrifice her whole personal identity the minute she reproduced back in their boxes, and tell them that Kevin was a nasty piece of work? 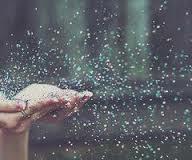 But now I think: maybe it doesn’t matter. After all, I’m bringing my own ethical framework – alright, my prejudices – to my interpretation of this book, just as much as anyone else; and the author is doing exactly the same thing. Maybe that means that Kevin has his own life now, independent of Lionel Shriver, existing in the imaginations of all those different readers? Maybe it doesn’t matter what the author thinks is the truth – perhaps each of those interpretations, each one of those different Kevins, is just as valid as hers? Recognising that we don’t really own or control our story may be frightening – but it’s also fascinating. Sending your characters out into the world for people to like or loathe, to decide what they think about their behaviour and motives – well, it’s a pretty exciting business, isn’t it? And while writing may be a solitary pursuit, I think that means that telling a story really isn’t. This entry was posted in Uncategorized and tagged characterisation, characters, first novel, novels, philosophy, re-writing, writing on 25/11/2013 by yakinamac. 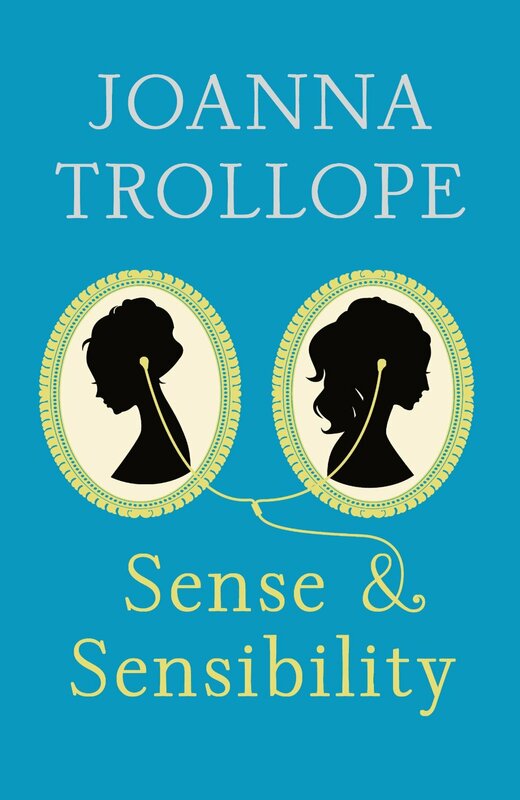 Last week, courtesy of an offer from someone I follow on Twitter, I had the privilege of reading an advance copy of Joanna Trollope’s reworking of Sense and Sensibility in a modern setting. As part of the evidently industrial-scale marketing of their “Austen Project”, which will see six contemporary novelists “reimagine” Jane Austen’s works, Harper Collins sent pre-publication copies to reading groups around the country, in return for their blogging about them, taking part in Austen-related activity and generally “immersing yourselves in the romantic world of Austen”. This has nothing to do with the writing. I’m not the biggest fan of Joanna Trollope – the covering letter says that this book “perfectly affirms the description of Joanna as a modern day Jane Austen” whilst subtly avoiding the direct claim that anyone has ever actually described her as such before – but from my limited exposure to her novels, she seems to write a reasonable story perfectly well. The disease stems simply from the misguided attempt to transpose Jane Austen’s characters into today’s world; unfortunately, it’s terminal. It is difficult to imagine it working well for any of Austen’s novels, so bound are her characters by the social mores of her time. It certainly doesn’t work for Sense and Sensibility, where at the very core of the plot lies the Dashwood women’s vulnerability, their inability to fend for themselves. At a time when women’s opportunities for work were strictly circumscribed, and any attempt by a woman of a certain class to enter paid employment would be accompanied by plummeting social status and the loss of former friends, the death of a provider and accompanying loss of a home is genuinely pitiable. Anyone with a second X chromosome can be grateful that this is not the case in England today. The result is that it’s difficult to summon up a lot of sympathy for Trollope’s tedious, middle-class women bleating that they’re simply not “fit for work.” Send them to ATOS forthwith! And instead of feeling indignant at the sisters’ dreadful sister-in-law Fanny and her lily-livered husband John, you can’t help feeling that they’re not, actually, behaving all that unreasonably. What’s wrong with wanting to move into and redecorate a home you’ve inherited? What’s wrong with feeling disinclined to share it – and otherwise financially support – your shiftless sisters and pointless mother, none of who have apparently seen fit to do a day’s work in their lives? It would have taken a little more than having Marianne listen to an iPod to bring this story successfully into the twenty-first century. It feels like we need some kind of desperate illness for Mrs Dashwood at the very least, if we’re going to be able to muster a bit of sympathy; perhaps Marianne could be autistic and Elinor have some kind of mental health problem to convince us that they really, really couldn’t be expected to work for their bread. Does take us rather far from the original story though, doesn’t it? And that’s the problem. We are all, to some extent, products of our time (anyone who’s cringed at racist comments by their grandparents will know the truth of that) and characters in fiction are no different. That doesn’t mean we appreciate their trials and tribulations any the less if they’re set in an historical context ; simply that when they’re plucked out of their own time and plonked down in another era, they’re often left shuffling uncomfortably in their new surroundings. 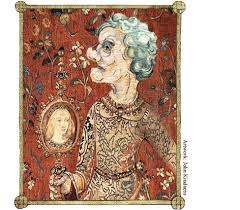 Shakespeare, of course, is the greatest casualty of this inexplicable desire to transplant characters out of time. The success of the Globe theatre demonstrates it’s a ploy that simply isn’t necessary to draw audiences: people are just as capable of imagining their characters in sixteenth century Verona as they are of empathising with them through their fears and hopes and loves. And whilst no-one has had the temerity to “reimagine” the Bard’s words just yet – not under the same title, anyway – the violence done to his language by ill thought-out changes of context can be gruesome. I’ll never forget the production of King Lear, attended with my A’-level English class, which had a 1930s Gloucester in a straitjacket instead of stocks, loudly declaiming his “wooden prison”. There were loads of those verbal-visual mismatches. Apart from being wildly distracting it Made No Sense. That’s not to say it can never work. I saw A Midsummer Night’s Dream set in a mud bath – yes, really – and it was brilliant. But it takes a lot of care and skill. You can’t just say, oh Shakespeare’s so wonderful, he transcends the boundaries of place and time, and set Macbeth in a New York doughnut factory without any consideration of the actual words. But back to Trollope (any relation?) and the Austen project. I’d like to say that, regardless of the difficulty of transposing Austen into the modern era, this is still a good read. Honestly though, I can’t. All the characters we’re supposed to sympathise with are so bloody annoying: Marianne is self-indulgent, self-regarding and downright rude; Elinor’s such a martyr she needs a slap; and this Colonel Brandon is even more of a wet fish than the original. Enough of them all! I see Alexander McCall Smith is lined up to rework Emma. I think he’s got an easier ride with that one, but even so… I might just content myself with re-reading the greatest English novelist of all time. This entry was posted in Uncategorized and tagged characterisation, characters, fiction, Jane Austen, Joanna Trollope, Sense & Sensibility, writing on 18/10/2013 by yakinamac. I was watching an episode of Columbo this weekend. That’s virtually unavoidable if you have a TV, given the frequency with which reruns are scheduled on one or another cable channel. And that’s a good thing in my book. It’s a strange thing for a detective story to ensure you’re so certain of whodunit from virtually the opening scene. And often, the opening scene actually shows the murder itself, so there’s not even any mystery about how they did it. There were 69 of episodes altogether, you know – I looked it up. I’ll admit it, I haven’t watched every last one – well, not so far as I know – but I’d be willing to bet that you could switch on at any point, and identify the perpetrator in less than a minute. Can you imagine pitching that idea? And yet Columbo ran for over thirty years, winning a whole pile of plaudits in the process. If Peter Falk had been immortal, they’d probably still be making it today. In that time, there were even a few of what Wikipedia calls “repeat offenders” – actors who did the dirty deed in more than one episode. Patrick McGoohan was the arch villain, appearing as the murderer in four episodes, while George Hamilton and William Shatner – yes, The Shat! – were each twice the guilty party. What was the secret to its success? It can only be one thing – the character of Columbo himself. And yet, how much do we actually know about him? Far from the heart-wrenching sub plots about neglected children or dissatisfied spouses that are an essential component of the modern TV detective, we never even set eyes on Mrs Columbo. We hear there are children, but they’re never seen either. 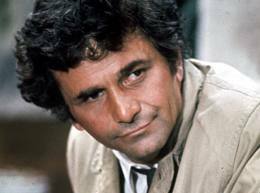 In fact, what we see of Columbo is virtually the same as is seen by the people he’s investigating. Perhaps that’s part of the trick. 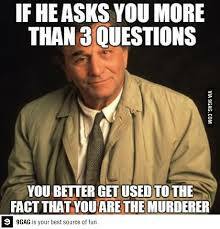 Whilst the other characters in general, and the murderer most particularly, underestimate Columbo, we never do. We can congratulate ourselves on appreciating his shrewdness, enjoying the game of cat and mouse he plays with his increasingly irritated suspects as they gradually realise that they’re not, after all, going to be successful in getting away with murder. I’m still not quite sure how the writers pull it off; how they keep things interesting whilst sticking rigidly to the formula for every episode. Perhaps it’s just that, despite not really knowing much about him, Columbo is an inherently likable man – warm, affable, the kind of chap you could take for a pint. And the visual props are an essential part of the package; the dishevelled hair, that tatty old raincoat, the cigar. Here, they seem to say, is a man who is comfortable in his own skin, a bit messy maybe; he has his vices, but they’re only small ones. Is it just me, or was the young Peter Falk actually quite hot? Like I say, I don’t know how they do it. But if I could pull off a character like that, I’d be a happy writer. People Are Strange – But Are They Strange Enough? How different are the characters you write about to the people you know? Whisper it: how different are they from you? Now, I like to think I’m fairly cosmopolitan. I live in a bit of London that could serve as a good location for a gritty and realistic crime drama. My husband is a different colour to me. 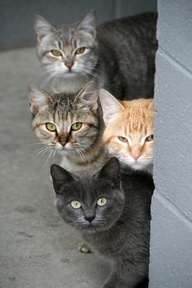 I don’t have kids, but I’m pretty sure my cats belong to a gang. I was also brought up in a tiny village in Wales where there was one bus a week and everyone knew everyone else. I went to university, but I was the first person in my family who did. 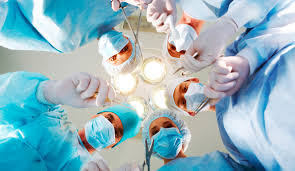 I have friends and family who are doctors, warehouse workers, academics, police officers, company directors, tube station attendants and shop assistants. Like I say, I like to think I’m fairly cosmopolitan. But I’m not. This was brought home to me a couple of times in recent weeks when, as a result of circumstances I must conceal to protect the innocent, I found myself in company with People Who Were Very Different to Me. If I tried to describe why I found them so different, I could say that some of them lived in different kinds of places – more or less affluent, small towns, rural areas or even just different cities. I could say that some of them had different sorts of family background and education to me. Some of them were quite a lot older, some quite a lot younger. But really, it wasn’t any of those things. It was that, for one reason or another, they had a very different outlook on life. A different way of relating to other people that’s hard to quantify. I found them difficult to talk to. I expect they had the same experience. It made me think: how individual, how genuine are the characters I write about? How different are they, not only from each other, but from me? Okay, I’m not – to my knowledge – a murderous psychopath or an increasingly unhinged, phobic charity worker, or an anally-retentive, overbearing older sister (alright, I might be that last one) – but how far away am I really from the thoughts that go on inside their heads? From their way of looking at the world around them? How far is it possible to give them a life that isn’t, in some way or another, my own? And doesn’t that make writing just about the most public bit of soul-bearing it’s possible to do? Hmm. I’m glad I didn’t think of that before I sent my draft to my beta-readers. This entry was posted in Uncategorized and tagged characterisation, characters, writer, Writers Resources, writing on 19/08/2013 by yakinamac.